Size 1 5/16" x 1". You will get 1 Dealer Button, 1 Small Blind, and 1 Big Blind Button. Material：Iron, Plated With Gold. SIZE：40X3mm. It is acrylic with the spade design inside the centre. Material: Acrylic. Weight: about 30 grams. Set of Small Blind, Big Blind and Dealer Button. 1 Piece Big Blind. 1 Piece Small Blind. 1 Piece Dealer Button. - Color: As picture show. Due to the difference between different monitors, the picture may not reflect the actual color of the item. Great condition pin. Not original pinback. Thanks for looking! We are in the processe of liquidating out Poker Supplies. 1 Piece of Dealer Poker Button. - Fashion design, light weight. - Material: Crystal. Qty. 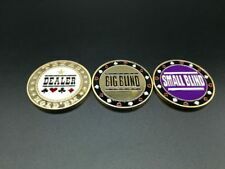 :one set (All In Big Blind Small Blind Dealer Button). Material: Acrylic. - Big Dealer Button with Rubber bumpers on sides. 1 Piece Dealer Button. - Color: White Top/Black Bottom. The product is new, never used and in good conditon, just go ahead and buy! Size of Blinds: 43 mm 3 mm. 1 x Big Blind Button. 1 x Small Blind Button. Material: Ceramic. Weight of Big, Small button : about 13 gram. Weight of Dealer button : about 25 gram. Size of Dealer button: 49 mm 5 mm. Size of Blinds: 43 mm 3.3 mm. 1 x Big Blind Button. 1 x Small Blind Button. Material: Ceramic, fine sand. Weight of Big, Small button : about 12 gram. Weight of Dealer button : about 20 gram. Size of Dealer button: 55 mm 3.4 mm. Set of Small Blind, Big Blind and Dealer Button. 1 Piece Big Blind. 1 Piece Small Blind. 1 Piece Dealer Button. The product is new, never used and in good conditon, just go ahead and buy! - Color: As picture show. It is acrylic with the spade design inside the centre. Material: Acrylic. Weight: about 100 grams. 1 - Blowout 2" White Dealer Button. It features USA (Lower 48 States) -FREE. Material: Acrylic. - Big Dealer Button with Rubber bumpers on sides. 1 Piece Dealer Button. - Color: White Top/Black Bottom. Limited Edition! PokerStars Dealer Button. 1PC 58mm Pressing Poker Cards Guard Poker Dealer Button Poker Chips B v! Type：poker dealer. Material：acrylic. Weight：75g. Color：transparent. 1 piece dealer button. - Clear, easy-to-see lettering in contrasting colors. 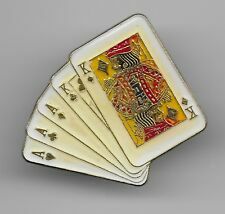 With white color incription "PokerStars.net ALL IN" inside trigangle. Professional look and feel. Size: 75x65x6 mm. Solid State by HTML5 UP. Color: Red and Black. 1 x ALL IN Button. Material: PVC. Material: Acrylic. Weight: about 70 grams. Beautiful and Exquisite，Portable, feel good. - Professional look and feel. Similar ALL IN button was introduced at the World Series Of Poker in 2006. We rarely make mistakes, but when we do, we will fix it them. Used when the player decides to go all in so that there is no mistake in the action. 1 Piece Dealer Chip. - Material: Stainless Steel. Size Chart. Transparent 5.8 cm x 1 cm Round Poker Button with Red Color Incription "ALL IN"
Size: 58 mm 58 mm 10 mm. Material: Acrylic. Weight: about 64 grams. Material: Acrylic. Weight: about 30 grams. One side is white and the other side is black with dealer carved on both sides. The all around double rubber bumper makes picking up and passing the button easy. Big Dealer Button with Rubber bumpers on sides. 3 Pieces Dealer Button. People always bought together with. - Size: Approx. - Color: as picture shown. - Material: Acrylic/Stainless Steel. These spacers can be found in almost every casino dealer tray. 20 CLEAR ACRYLIC CHIP SPACERS. USA (Lower 48 States) -FREE. 1 piece dealer button. - Clear, easy-to-see lettering in contrasting colors. The product is new, never used and in good conditon, just go ahead and buy! - Beautiful and Exquisite，Portable, feel good. Quantity: One set (1 Big Blind 1 Little Blind 1 Dealer Button). 1 Set Poker Bottons. - There are letters on both side. - Material: Acrylic. - Color: White, Blue, Yellow. Due to the difference between different monitors, the picture may not reflect the actual color of the item. This button is heavier and wider than a standard dealer button. This is our exclusive Heavy Elegant Dealer Chip Button. Both sides are shown. My hopes is that this golden pin brings much luck to those that buy!! Beautiful gold colored.. This item have never been worn but may have imperfections due to storage and age. We rarely make mistakes, but when we do, we will fix it them. (Big button, white Dealer Button),(small button ,"Big Blind", "Small Blind ","Reserved","Kill","Missed blind"). Qty. :6pcs/set(as picture,one big and five small). These beautiful gold plated dealer buttons are a unique classy addition to your poker set.